There's no hiding that the Chinese love them some Buicks, so what's better than shoving seven Chinese into a new Orlando-based Buick MPV Concept that's debuting at the Shanghai Auto Show next week. 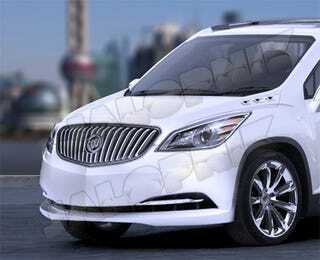 Exact details are very scarce, but according to GM's official 2009 Shanghai Auto Show press release and an insider tip, we've learned that a new Buick 7-seater MPV concept will strut its people-carrying stuff onto the stage during one of the media days, either Monday or Tuesday of next week. We've been told that it'll be Chevy Orlando-based, but we'll believe it when we see it in the flesh. There's also talk that it may be based on the upcoming Opel Zafira MPV now that the Opel/Buick wündershowzen has begun. We'll know for sure next week, but considering that the recently on-sale-in-China Buick Enclave sells for around RMB 475,000 ($70,000 USD), they might need a less expensive people hauler to compete with market-rival Audi's new Q5 SUV. Aside from the Buick MPV concept, GM will show 37 other models, including the Chinese-market Cadillac SRX, Buick Regal 2.0 Turbo, Chevy Volt and the Chevy Camaro of all things. The 2009 Shanghai Auto Show runs April 20 - 28. Shanghai – The General Motors China family will be displaying 37 production and concept vehicles at Auto Shanghai 2009, this year's leading auto show in China, which begins on April 20. "Our display will highlight the design, technology and fuel economy leadership of GM and our joint ventures in China," said Kevin Wale, President and Managing Director of the GM China Group. "It will show local vehicle buyers the great selection of products available today and some of the exciting products they can expect tomorrow from the GM China family." Shanghai GM will have on display its full range of Buick, Chevrolet, Cadillac and Saab models as well as several new vehicles. Making its global debut will be a unique show car developed by the Pan Asia Technical Automotive Center (PATAC), GM's automotive engineering and design joint venture. Another vehicle making its public debut in China will be a production version of the Chevrolet Volt, the world's first extended-range electric vehicle, which will be coming to China in two years. Among the other new products on display will be GM's first vehicle with a turbocharged engine built in China, the Buick New Regal 2.0 Turbo intermediate sedan; GM's second hybrid that will be sold in China, the Cadillac Escalade Hybrid SUV; and the latest global product from General Motors, the Chevrolet Cruze compact sedan. Making their regional debut are the next generations of the Buick LaCROSSE premium sedan and the Cadillac SRX mid-size luxury Crossover. Both products will go on sale later this year. Two vehicles that will be sure to draw auto show visitors' attention are the Chevrolet Camaro sports coupe (and star of the new "Transformers" movie) and the Chevrolet Cruze World Touring Car Championship model. SAIC-GM-Wuling will be displaying its popular lineup of Wuling brand minivans, including China's most popular vehicle in 2008, the Wuling Sunshine. It also will be showcasing the Chevrolet Spark, one of the world's most popular mini-cars and a mainstay of the SAIC-GM-Wuling lineup, and a pair of B-DOHC engines. Making its first appearance at an auto show will be Shanghai OnStar Telematics Co. Ltd., GM's new telematics joint venture, which will begin rolling out its services in China later this year. "General Motors has made a long-term commitment to China," said Wale. "Despite the challenges that GM and our industry now face, we believe our best years are ahead of us. One look at the GM China family's lineup on display at Auto Shanghai 2009 will convince even the most hardened skeptics." Auto Shanghai 2009 runs from April 20-28 at the Shanghai New International Expo Center.